By now, television viewers are prepared to strap in and enjoy the vicarious mayhem caused by a good antihero. Narcos is the story of the real-life drug kingpin Pablo Escobar, a poor country boy who used his wits and a whole lot of violence to make himself, at the height of his powers running the Colombian cocaine business, among the top ten richest men in the world. He also—as revealed in the Netflix series’ first season—was responsible for turning Colombia into a literal war zone, littering the countryside and city streets with bodies of rivals, politicians, judges, police, soldiers, and anyone unfortunate enough to live in a country where the trafficking of cocaine meant unimaginable wealth and power to he who was prepared to do the unimaginable. Like any show centered on an antihero, Narcos rests on the back of its lead actor, and the remarkable Wagner Moura is Narcos. (Which makes the recent news that the show will continue after this season something of a surprise.) The show took a lot of justifiable criticism for initially presenting itself as a head-to-head contest between Moura’s Escobar and series narrator, American DEA agent Steve Murphy. Murphy’s self-impressed exposition and pontification about Escobar and Colombian society initially colored Narcos as the wanly McConaughey-esque Murphy’s war to win. However, the show cut back Murphy’s narration in the back half of season one, and the show—whether by design or as course correction—started to subtly tease out the fact that the gung-ho, patriotic, rule-bustin’ cowboy cop Murphy might, as a representative of 1980s US foreign policy in Central and South America, be part of the problem. Regardless of that, however, the Escobar-Murphy contest is almost entirely one-sided dramatically. For one thing, as Murphy’s more plugged-in partner, Javier Peña, Pedro Pascal makes for a more compelling and lived-in antagonist for Escobar. But Wagner Moura (veteran of the blockbuster Brazilian Elite Squad movies, which where directed by new Narcos co-showrunner José Padilha) is a towering presence at the heart of the show. Despite his boyish face and untoned build (Pablo is always defiantly leading with his pot belly in confrontation, and this season evinces a preference for dad sweaters), the physically unimposing Moura quickly established himself as a uniquely riveting presence. With his unexpectedly deep rumble of a voice, Moura’s Escobar commands attention like few other antiheroic monsters of recent memory, a virtue that also doubles as Narcos’ main narrative vice. When it comes to establishing audience TV antihero empathy, there’s a standard checklist. Love of family and friends is always at the top, and Escobar’s fierce love for his tiny but formidable wife Tata, stalwart mother, and kids, comes through with Maura’s signature intensity. His reunion scene upon escaping from Escobar’s self-designed prison/pleasure palace La Catedral in the premiere is the most intimate and passionate in the show’s history. (Moura delivers Pablo’s promise to the tearful Tata—“We’ll be fine, and content, and happy, and together, and united”—with such love and conviction.) But everyone loves their family, and—especially watching Pablo’s bloody, 15-year rise to power in season one—there often wasn’t much more than Moura’s presence to make Pablo Escobar human enough to be relatable. After all, apart from the everyday shootings and bludgeonings (of enemies and associates alike), Pablo Escobar: put bounties on cops and their families; corrupted every branch of the Colombian military and government; orchestrated a siege of the country’s Supreme Court (resulting in the death of half the justices); ordered the murder of presidential candidates and other major government figures; and waged a terrorist campaign (beginning by blowing up an airliner) that left thousands dead and life in Colombia a living nightmare. And that’s not counting the cocaine. The fact that all of screen Escobar’s criminal deeds are more or less directly attributable to the actual Escobar couldn’t prevent season one from sometimes looking like a supervillain’s origin story. With Padilha and Eric Newman paring down season two to a shorter time period—stretching just from Escobar’s escape from La Catedral in 1992 to his murder in 1993—it’s interesting to see how the show will find ways to bring Pablo Escobar back toward relatable humanity. The premiere shows immediate signs of shedding dead weight as part of this accelerated pace, with Murphy’s wiseass narration kept to an expository minimum once we’re caught up. (Phrases like “Okay, here we go again,” and “Let me break it down for you” signal the narration’s newly perfunctory nature.) And, with shocking but not unwelcome speed, Murphy’s ever-worried wife, Connie is shown the airplane door back to America halfway through the episode, toting the Murphy’s adopted orphan baby while she calls from the airport to, once again, tell Murphy how worried she is in Colombia all the time. Which leaves Murphy and Peña free to wage their semi-legal campaign against the newly-escaped Escobar and his men. One of Narcos’ great strengths is how it makes the reality of sudden, violent murder an everyday fact of life in Colombia. Any time a character is shown standing near a window or sharing a moment of quiet intimacy with a loved one, the anticipation of a hail of automatic weapons fire keeps the tension primed. So when Murphy gets that call from Connie and begs off a planned mission to intercept one of Pablo’s sicarios (hitmen) at a brothel, the ensuing chase and gun battle fairly crackles with dread. (There’s a strikingly framed shot from episode director Gerardo Naranjo placing the backlit Peña in a dark doorway that makes him look marked for death.) Last season worked hard to chart how Murphy’s time in Colombia has made him more callous and willing to break the rules in order to nail Escobar. (Remember him shooting out the tires of a cab driver he rear-ended?) But Murphy’s descent here remains far less interesting. Drunkenly baiting and then brutally beating two gringo businessmen doing blow in an airport bathroom stall after he fails to stop Connie, Murphy’s hauled away by security. Lashing out at American drug purchasers continues Narcos’ efforts to make Murphy more complex, but Holbrook’s Murphy remains a much thinner character than Pascal’s Peña. But, again, it’s Moura’s show. 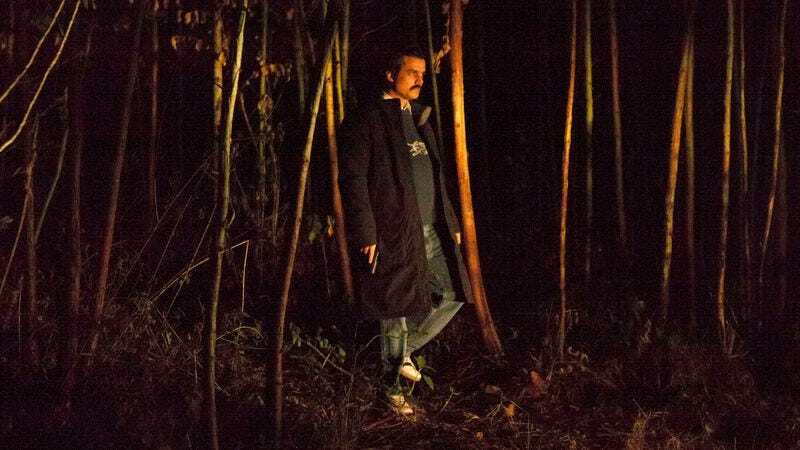 In the first scene of the season, young soldiers searching the dark woods around La Catedral for Escobar and his men swap stories about Pablo being shot twenty times and burned, only to rise from the ashes with vengeance in his eyes, introducing the idea that Pablo’s become a legend, a boogeyman. And then the boogeyman appears. Striding confidently from the obscuring trees into the soldiers’ circle of lights, he responds to the lead soldier’s statement that they must arrest him with a calm, polite, “Son, I’m sorry to say, unfortunately, I cannot allow that to happen. Excuse me.” Then he completes his escape past these heavily armed military men by simply walking away into the darkness. It’s a stunner of a scene, echoed by another later in the episode. When the hotheaded brother of Judy Moncada, who’s looking to avenge Pablo’s murder of her husband by running coke herself, pleads with the Escobar men who’ve come to kill him, he blurts out “Pablo is weak right now!” Cue Pablo walking unexpectedly into frame in the background with a quietly terrifying “Hello, Jaime.” The legend of Pablo has only grown during his incarceration, and Narcos sees Escobar cultivating the country’s fear and reverence. And he needs to. Legend or no, Escobar is vulnerable on several fronts. His men are depleted, the factions of his Medellín Cartel are splintered and watching for weakness, rival Cali Cartel is continually plotting his demise, and Colombian President Gaviria has mobilized essentially every soldier and cop in the country to track him down. Refusing to be cowed by any of this, Pablo has loyal sicario La Quica recruit a taxi driver to take him around the city, stating defiantly, “I want people to know that Pablo Escobar doesn’t hide like a rat.” (Jaime essentially seals his fate when, just before Pablo shows up at Jaime’s coke lab, he sneers that Pablo’s trapped like a rat.) Keeping up his image and the legend of his invincibility is key to staying in power, certainly, even if Pablo must make his rounds while stuffed in the trunk of a taxicab. But, as Moura plays Escobar, Pablo’s defiance is simply part of who he is at this point. In a season where Pablo Escobar is, indeed, going to be penned in further and further, watching how Narcos delves deeper into its antihero protagonist will be key. As fascinating as Moura makes Escobar’s every move, there’s the question of how much there is to discover about the character—and how much Narcos is planning or willing to humanize him. Moura makes Pablo Escobar eminently watchable. There’s a certainty to this Escobar that’s simply terrifying—under those hooded lids, Pablo’s calm is as unsettling as those moments when he bursts into murderous rage. Capable of great tenderness and loyalty, he’s yet a roiling, unassailable mountain of will that will simply brook no debate as to his essential rightness. Moura mesmerizingly plays with that idea. Last season, when Manolo Cardona’s vice minister of justice Eduardo Sandoval accused Escobar of having killed two of his own associates, Moura made Pablo’s defiant denial the monumental, wounded cry of a man being subjected to the greatest injustice. Except we’d just seen Pablo brutally bludgeon one of the men to death with a pool cue, and Pablo’s speech is nothing but a passionately powerful lie. Is he play-acting for the benefit of Sandoval and his men? Is he working from a place of self-regard so monstrously implacable that he himself believes it? Like walking past those soldiers, Pablo wills things to happen and, thus far at least, they usually do. What happens to this character once his will begins to be thwarted throughout this season (as in the final scene here, where Gaviria places a bounty on Pablo’s head on national television) will ultimately determine—as much as Moura’s exceptional talent—how memorable an antihero Pablo Escobar will be. Also, I’ll be reviewing the episodes individually, without referring to future events. In the comments, let’s all be good streaming citizens and do the same, yeah? Or, if you simply can’t help yourself, at least SPOILER the hell out your comment. That being said, I didn’t spoiler warning the fact that Pablo Escobar is dead. Actual history doesn’t need spoiler warnings. After all this time, Murphy still hasn’t really learned Spanish? C’mon, Murphy. La Quica’s appearance here underlines just what makes Escobar’s sicarios so frightening. Young and rootless, they have been taken in by a powerful man who, as long as they serve him loyally, affords them free reign to indulge every swaggering desire without consequence. The way he puts his hand on the leg of Limon’s terrified and disgusted passenger/helper Maritza (Martina Gracia) while propositioning her implies nothing but privilege, his sleazy come-on lines making her (and our) flesh crawl. For the open-faced Limon, making what passes for a straight living driving prostitutes around town in his cab, the opportunity to serve Pablo undoubtedly means trouble. But he reaffirms much of what made Escobar so popular, his earnest “You’ve done so much for the poor of Medellín” showing how, to Colombia’s powerless and impoverished, Escobar’s largess superseded much else.